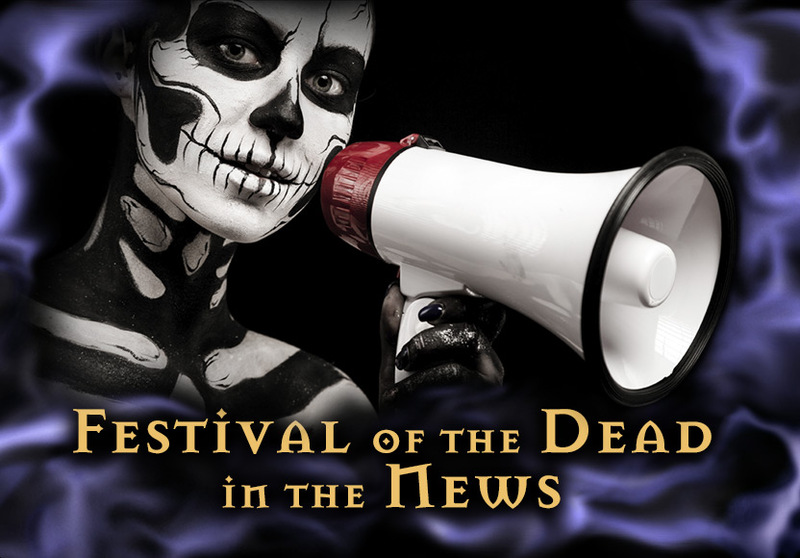 Festival of the Dead - Apocolypse Now? Shawn and Christian offer up their views of the significance of June 6, 2006 to the Boston Globe. 6/6/06 is a once in a century occurance and some believed it would herald the return of Old Nick. We're not sure if that really happened but it was one hell of party! The Devil made us do it! The release of a Hollywood film drives global chatter about biblical prophecy. Around the Web and on billboards, book jackets, and T-shirts come warnings that soon our number will be up and the devil will have his due. Christians and "The Da Vinci Code"? Try doomsayers and "The Omen," a remake of the 1976 horror classic in which the Antichrist appears and all you-know-what breaks loose. The movie's release date, June 6, is neither arbitrary nor unportentous, according to believers in the Rapture as New Testament eschatology -- or in the new theology of mass marketing, take your pick. Numerically, the date computes as 06/06/06, a once-in-a-century occurrence. Because "666" corresponds to the biblical "mark of the beast" set down in the Book of Revelation, Tuesday will be no ordinary spin of the planet, according to some with a predisposition toward the satanic or apocalyptic. "I'm going with something big happening," writes one poster on armageddononline.org , foreseeing a nuclear attack in the Middle East. Others speculate more playfully that babies born Tuesday will be christened Satan or Damien, or that "nutjobs" will use the date as an excuse to behave a bit devilishly. It is no coincidence, though, that the pop-culture hype machine is cranked up to exploit the date in every way possible. For weeks, billboard ads for "The Omen" have proclaimed "The signs are all around you" and "You have been warned." Heavy metal bands such as Deicide , Behemoth, and Slayer are releasing music on the date, launching summer tours, or sparking fan celebrations. The album "Strummin' With the Devil: Bluegrass Tribute to Van Halen ," featuring David Lee Roth, hits stores, too, while Radio Free Satan airs its "Satan's Rockin' 666 Eve Party" on the Web and the Church of Satan's Los Angeles franchise stages a sold-out "satanic high mass." For $17, end-of-timers can buy a black T-shirt (at darktshirts.com ) with "06-06-06" printed on the front and a pentagram on the back. Steve Frazier says he and his business partner got the idea after spotting an "05-05-05" T-shirt during a Cinco de Mayo celebration last year. Frazier promptly bought several 06/06/06-related domain names and set about designing a product to capitalize on them. Does he believe the Antichrist is really due here Tuesday? "If you want to be realistic about it, no," says Frazier with a laugh. "Why would he come in 2006? But you never know." At least one expectant mother is worried enough to try re-engineering her delivery date to avoid the dreaded triple-sixes. Melissa Parker of Caversham , England, a fan of "The Omen," told The Sun last week that she's "terrified the birth will go wrong or the child will have evil in him or her." (A hospital spokesman says Parker's request to be induced earlier has been refused.) Meanwhile, bibliophiles of a certain mind-set can look forward to the latest volume -- and final prequel -- in the best-selling "Left Behind" series, titled "The Rapture," which describes a day when "Heaven rejoices as millions are welcomed into the unspeakable presence of God," according to one advance blurb. Not looking to be left behind, either, is conservative pundit Ann Coulter , whose latest book, "Godless: The Church of Liberalism," not only tweaks liberalism as the new state religion but noisily advertises its own 06-06-06 launch. And if all that's not sufficient to tilt the cosmos on its axis, the Red Sox invade Yankee Stadium for a date with the Evil Empire. Will there be a Joe Hardy-Bambino moment? Fans with haunted memories can almost bet on it. Still, in Salem, where the supernatural is frequently treated as super-ordinary, there's scant evidence that June 6 is being handled with care. According to the city's tourism bureau, no special 06/06/06 commemorative events are planned. "I don't think it has any significance, although it might for some people psychologically," says Christian Day , a practicing witch in the North Shore's Witch City. "The core of satanism is really hedonism. So symbolically I guess it's a day to rock on with your bad self." Shawn Poirier , an event planner who serves as high priest of Salem's witches, agrees. He plans to "dress up gothy and scary," as Poirier puts it, and go see "The Omen." But he's not fretting about the world coming to an end. "To me, it's a keg-party day," says Poirier. "A pop-cultural phenomenon signifying rebellion as much as anything." Gene Chambers , owner of a new age bookstore in Plymouth called Incantations, suggests that the only people fixated on 06/06/06 are "Christians and Hollywood," as he puts it. And probably more the latter. "Seriously, within my group no one cares," says Chambers. "It's great marketing. But I'm more disturbed that someone is remaking `The Omen,' which I loved." Horror flicks and death-metal posturing aside, biblical scholars such as Boston College theology professor Harvey Egan point to several flaws in taking Revelation's "666" too literally or too ominously. For example, he says, the numerical representation is probably that of the Roman emperor Nero, not the devil or Antichrist. "In mainstream Catholicism there's very little emphasis on this figure," says Egan. Aligning modern dates to biblical passages is problematic, he adds. "Which calendar do you choose? Gregorian? Also, how do you count months of the year? In Judaism and Islam, there are not 12 months." Feel better? Not so fast. While the online gaming site BetUS.com is posting 10-to-1 odds on the world ending in three days, The Farmer's Almanac forecast for June warns of a grave threat unrelated to biblical prophecy or blockbuster movies. "The threat comes not from strange and distant lands or from tumultuous peoples who wish us harm," the almanac's authors write, "but from another unlikely quarter: squirrels."